Which are the factors that make a garage door traditional or modern? Does the material play a vital role or it has to do entirely with the design? Let’s just say that every little thing will make a difference. The truth is that everything new is considered contemporary. Traditional garage doors are…traditional. They’ve been around for long and are labeled as classic options. Still, today there are Victorian, French, Tudor, Craftsman garage doors and all sorts of styles in between. Now, the questions are: Which one will be the best fit for you? And will it be classified as modern or traditional? Let’s see. Traditionally, garage doors were made of wood and swung outwards. That’s what we call carriage garage doors. But then technology made its first step forward and steel garage doors stole the show due to their durability, longevity, and cheaper price. Today, we consider all wood, steel, and aluminum garage doors traditional. That’s as far as the material is concerned. Because what makes a garage door traditional is also its style & size. Surprised about the reference in the garage door size? Well, picture an oversized overhead door. It’s not something you see every day. Most residences have average door sizes. And so the unique feature of the large size will add a touch of modernity to it. As far as the style goes, traditional doors often have a row of windows at the top section of the upper panel, decorative hardware, & diagonal or horizontal rails. Classic example? The carriage house garage doors. Glass garage doors. Should we say more? It can’t get more modern than that. Does this mean that glass doors are the only modern option? Certainly not. Although wood is not a classic representative of modern garage door materials, the material of contemporary styles can be anything from steel to aluminum. It has more to do with the style. Contemporary garage doors lack the rather heavy decoration and austere look of their traditional counterparts. They are kept plain, just like flush garage doors. They are stripped from elements which will make them rustic. The main feature here is the clean lines. Nothing stands out. Nothing screams for attention. In fact, many contemporary overhead garage doors don’t even have windows. And even if they do, their configuration is entirely different from that of the traditional doors. They might be placed on the side. As for the colors, brown is often excluded. Black rules. White is back in the game. 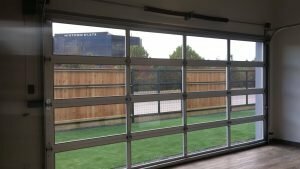 How to find your garage door style? The difficulty is to match the home style with the garage door style. You might love the modern looks of a glass garage door but if your home won’t support the style, it won’t look as good as in a modern residence. So, start from there. Unless you want to reconsider the improvement of the whole exterior home style, it’s best to stick to the current style. And then you can play with styles. For example, if you’d love a modern overhead door but your home is traditional, choose a classic door with no extra decorative elements. Or avoid brownish colors and stick to a white raised panel garage door. It’s classic but not traditional. The good news is that there are many choices today and you can do all sorts of combinations to gain a new garage door style without losing the identity of your home.